Large lakefront home with two decks, two kitchens and two living rooms. Cougar Bay Beach House is a large home overlooking Lake Coeur d’Alene in an incredible location. Whether you’re enjoying the view through your bedroom window, relaxing on the decks or down playing on the sandy beach, you’ll enjoy every minute of staying in this lake house. When you’re ready to enjoy downtown Coeur d’Alene’s public beaches, parks, shopping, dining and entertainment, you’ll be an easy 5 minute drive away. You could call this home the house of twos because it offers doubles of nearly everything! There are two kitchens, two living rooms, two dining areas and two outdoor decks. With the exception of a dishwasher only found in the upstairs kitchen, both kitchens are fully stocked with plenty of counter space for everyone to pitch in a hand. Both kitchens have islands with extra seating—2 seats upstairs and 3 seats downstairs. In the dining rooms you’ll find a table that seats 6 upstairs and a table that seats 4 downstairs. For indoor recreation and relaxation, you’ll enjoy a fireplace, lake views out the large windows and plush seating in the upstairs living room. Downstairs offers even more lake views, a TV and comfy futons. The two living areas also each offer deck access to the, of course, two decks. Sleeping 12, this home has three bedrooms—all with queen beds—and three comfy futons. The master bedroom is complete with a window AC unit, deck access and an attached master bathroom with a shower. Another full bathroom with a shower/tub combo is available plus a half bath. The amenities of this lakefront utopia continue outdoors. You can relax and dine on the two decks stocked with plenty of tables and chairs, plus a great BBQ. A private wooden staircase takes you down to the waterfront where you can relax or play on the soft sandy beach. There’s also a picnic table and a fire pit for fun evening gatherings. If you’re looking to get away from it all and experience Coeur d'Alene's natural beauty and wildlife, just travel south on nearby U.S. Route 95 to Idaho's Cougar Bay Preserve. With over 2 miles of self-guided informative walking trails, this 88-acre nature preserve is an ideal place to hike. If you prefer, you can also kayak/canoe the expansive shoreline. This preserve is home to numerous species of nesting and migrating waterfowl, moose, beaver and deer, so keep your camera and binoculars handy. 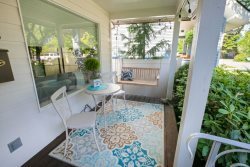 You can’t beat the location and doubled amenities of this Lake Coeur d’Alene beach house! *Please note: Vacation Rental Authority manages all initial bookings and reservation payments for Cougar Bay Beach House. Guest services, including 24/7 on-call, is managed by this property’s owner—NOT Vacation Rental Authority. After your final payment, you will receive the owner’s contact information.